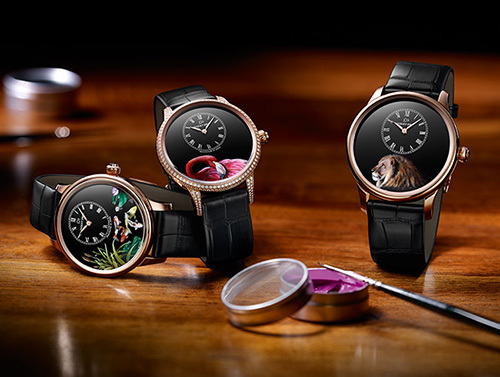 Luxury watchmaker Jaquet Droz now introduces new “Petite Heure Minute” watch versions. The new luxury watch collection features fascinating creatures, representing Asia, Africa and the Caribbean. The collection beautifully depicts Koi Carp, a lion and a flamingo. Three timepieces make up the Petite Heure Minute collection from Jaquet Droz. The stylish watches bring together miniature painting and black Grand Feu enamel. When combined, they invite one to travel to far exotic places. The talented professionals at Jaquet Droz are amazing. The artisans, engravers, enamelers and painters have long mastered using contrast in their work. In the latest luxury watch collection, Grand Feu enamel has been utilized. The result is a uniform black background that really highlights the creatures shown on each watch. Watch collectors are always on the lookout for new timepieces to add to their collection. In addition, many people buy fine watches for their own personal use. These watch connoisseurs will also appreciate the beauty of the 3 new Petite Heure Minute pieces. The African lion version is visually stunning. The lion is the king of beasts and a true symbol of strength. It’s power and mobility is well known. On the lion watch, the safari cat’s mane is composed of various shades of brown, black as well as russet. As a result, it contracts beautifully against the black enamel background of the watch dial. The watch case measure 43 mm in diameter. The case is made from brilliant red gold. It’s a bold watch, just like the lion on its face. Each watch model features a self-winding mechanical movement. Plus, they also include a 68-hour power reserve for reliability. This Petite Heure Minute watch collection from Jaquet Droz is available in very limited edition quantities. Only 28 pieces of each of the 3 models will be made. Each watch will arrive with a certificate of authenticity from the Ateliers d’Art. In addition, the certificate will be signed by the artisan who created it. If you are ready to purchase a Petite Heure Minute watch, please contact us today. In addition, we also work with the best luxury watchmakers from around the world. Follow this luxury blog to read the latest watch industry news and product releases. ← The Regal Lion Wine and Decanter Stoppers – Simply Stunning!